Yesterday, I was at war. Alisha was restless the whole day. Everytime I placed her in her cot to sleep, about 10 – 15 minutes later, she’d wake up wailing her lungs out. I was baffled. My baby is definitely not a cryer. Heck, she barely cries even when her tummy is upset. Even my mother in law found it disturbing. We’d take turns picking her up to comfort her but everytime we put her in her cot, she’d wake and cry again. I thought about as much. “Panas kot dekat babycot dia nih”, was my reply. So my MIL immediately went to my room, and we started shaking her pillows and toys. Then, my MIL picked up her comforter which was folded at the end of the bed and oh my god, ANTS!!! Semut merah yang halus-halus tuh banyak gila ok!! No wonder Alisha was crying, those little pesky no good tiny pests!! I then washed my hands and put a thin layer of minyak gamat on Alisha’s ant bitten cheeks. Siaaaannnn baby Mommy!! 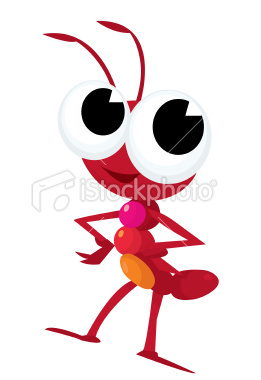 Apparently, babies tend to attract these tiny red ants because they smell milky. So a piece of advice to everyone with newborns and older babies, BEWARE OF RED ANTS!! lol. i've been on an ant war too. eeee ants??! hate em! hate em! ciannyee little missy dot..
biar semut2 itu mati dalam keadaan yang paling sadis..berani dia geget alisya eh..
omg! horror nye! is she ok? ko check lubang telinga ape sume? takot masuk jek. bwk jumpe doctor la. biar dia check betul2.